While enjoying lunch outside today, I received a text from the hubs that said "It's summer." If you call high 70's and a slight tan line from sitting outside for 30 minutes summer...well then, today it's summer in Pittsburgh! As the temps rise, I’m really into a number of the beverage transportation items to keep drinks cold. These cooler totes are super cute and I think I may just snag one of these to keep my bottles looking cool and staying cool this summer. 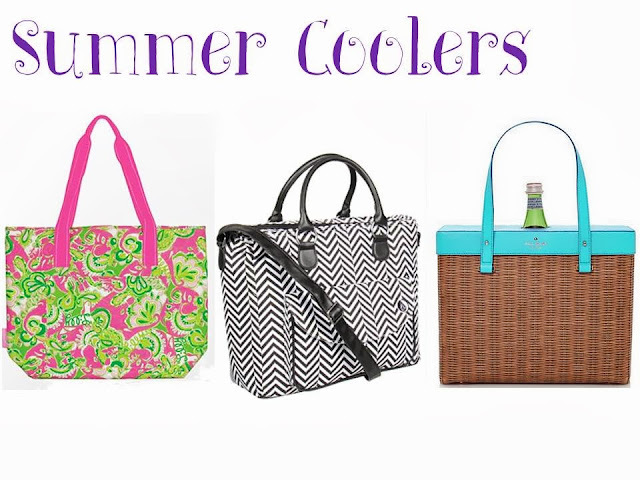 · Lilly Pulitzer Insulated Beach Cooler – this pretty pouch comes with a bottle opener! Heck yes! · Volcom – I know I don’t own a skateboard or BMX bike, but I wouldn’t mind owning this. · Kate Spade Wine Picnic Tote – uh huh. Want.